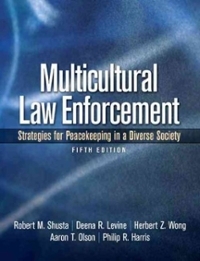 Authors:Robert M. Shusta, Robert M. Shusta M.P.A., Deena R. Levine, Deena R. Levine M.A., Herbert Z. Wong Ph.D., Herbert Z. Wong, Aaron T. Olson, Aaron T. Olson M.Ed., Philip R. Harris, Philip R. Harris Ph.D.
Multicultural Law Enforcement 5 Edition MULTICULTURAL LAW ENFORCEMENT: STRATEGIES FOR PEACEKEEPING IN A DIVERSE SOCIETY, 5/e explains how the influences of culture, race, and ethnicity impact law enforcement and the communities they serve. Known for its breadth of coverage, this classic text addresses a variety of populations and includes new material on the mentally ill, the homeless, gangs, immigrants, Native Americans, multiracial groups, and cross-cultural communications styles. Using cases, guidelines, and protocols, it focuses on the contact police officers and civilian employees have with the community and stresses the importance of cultural awareness, understanding and respect.